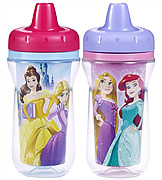 Set of two (2) 9 oz insulated non-spill sippy cups. Double wall insulation keeps drinks cooler longer. Screw on lid for secure closure. Valves are built into cup lid. Includes one of each of the two cups shown.